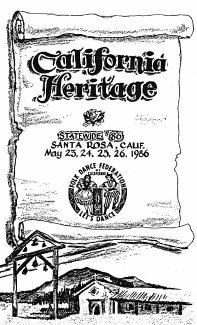 For this particular writing I have come to the final 41st Annual Statewide Festival attended to date. 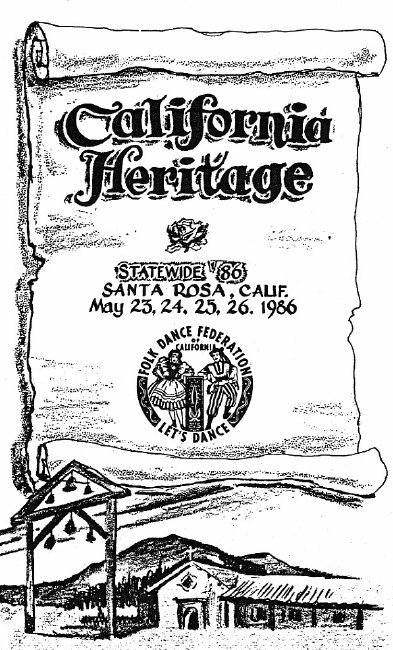 It's "California Heritage," in the beautiful city made famous by Luther Burbank, Santa Rosa, May 23, 24, 25, and 26, 1986. Chairperson Frank Bacher did his homework prior to the selection of the Fountainhead Inn as headquarters. Its location, somewhat removed from downtown Santa Rosa, gave one the feeling of being in the country with all the conveniences of a modern up-to-date hotel. Costwise, it was pleasing to everyone's pocketbook. Good work! The Festival program contained welcomes from the Chairperson of the Board of Supervisors, the Mayor, and similar expressions from President Oscar Faoro and Festival Chairperson Frank Bacher. That's what i call a proper welcome! The Warm-up Party Friday was in the Lodge Room of the Auditorium. The Institute Saturday afternoon was held in the main Auditorium, followed by the evening Festival with ballroom dancing in the Lodge Room next door. The Installation Brunch in the Fountainhead Dining Room took place Sunday morning, Chairperson Vi Dexheimer and Ernie Dresher as MCs. Elmer Riba led the Pledge of Allegiance to the flag and Lawrence Jerue offered the invocation. The installation of officers was conducted by Southern President Marshall Cates and Northern President Oscar Faoro. The latter accepted his Past President's pin from incoming President Florence Payne, being pinned with no serious injury, while Marshall Cates passed as he has another year to serve. Things happened fast Sunday afternoon with the Concert, chaired by Burt Sholin, along with the Costume Parade with Evelyn Woodworth in control. Following the Concert, the dancing continued in the Auditorium and again Sunday night. In the Lodge Room next door there was a ballroom dance going on, not a part of our program, but we were invited. I found myself busy with some more of those Southern California gals once again. No complaints! The Kolo Kids were not neglected, with regular hour and after hours dancing, mostly in the Lodge Room. Monday we finally found the Howarth Park Gazebo Picnic Grounds for the Barbecue and more dancing. Some of the Committee members not mentioned previously are: Chairpersons, Marilyn Wathan and Bruce Mitchell; After Parties, (unknown); Callers, Max Horn; Decorations and Program, Frank Kane; Institute, Elsa Bacher; Masters of Ceremonies, Bruce Wyckoff; Dance Selections, Ruth Ruling; Sound, Frank Bacher; and a lot of others.